Chief Architect is proud to be a Green company and provide these resources for green building and design. Our company has chosen to significantly reduce our packaging materials and inventory. Our packaging size has reduced by over 50% and additionally we’ve minimized, and in some cases discontinued, printed User Manuals (over 1,500 pages per manual for Chief Architect Premier alone!). What this means is we are using less raw materials from trees and petroleum, and less energy to produce, store and ship our products. As a result, less waste is generated by our customers at the end of the product life cycle. Even better, when customers choose to download our home design software products, there is zero usage of packaging or the services used to create, deliver and dispose of the packaging—a win-win for our environment. We invite you to explore, in Chief Architect’s software and on our website, resources and content for learning more about the green building and design process. We hope you will find information that will help you be more Green for your next design! Cross-reference the image markers with the list below for suggestions and descriptions of Green building techniques. Follow the links for more information on a specific topic. Passive Solar Design, like these skylights and large south-facing windows, reduce electrical lighting needs and helps heat the building in winter months. Metal Roofing is durable, long lasting, energy efficient, and available in a wide variety of styles and colors. What’s more, metal roofing is recyclable, unlike some of its counterparts. Solar Attic Fans or other self-powered systems are both green and cost-effective additions to any design. Roof Trusses and other factory engineered components are a more efficient use of raw materials, and they cut down on jobsite waste. OSB, like other wood chip based products, makes use of small trees and waste wood, allowing the conservation of larger trees. Energy-Efficient Windows that have multiple panes, low-E coating, and are paired with quality window treatments help keep the sun’s heat out in the summer and add insulation value during winter. Look for windows with a low U-Factor for the best energy savings. Deciduous Trees, when planted strategically, block the hot sun while shading southern exposures in warm months, then let the sun’s heat in when its needed once they lose their leaves in fall. Rain Collection Barrels and Cisterns recycle grey-water run-off from the roof that can be used for irrigation, drastically reducing water bills and conserving drinking water. Tank-less Water Heaters are energy efficient and provide more constant hot water. Other HVAC systems provide efficiency with comfort, like Geothermal Heat Pumps which gain heat from the earth and radiate it throughout the home. Well Insulated and Drained Foundations complete an efficient building envelope and create comfortable living areas in basements. Eco-Friendly Flooring, like bamboo, cork, reclaimed wood, and linoleum, are available in a wide selection of colors and styles. Energy Star Approved and High Efficiency Appliances save water, electricity, and cut utility bills. Low-Flow Toilets and Faucets drastically reduce water consumption. Engineered I-Joists and Floor Trusses reduce lumber consumption with increased span capacity and by being composed of less wood materials. Their larger depth allows for more insulation value (R-Value) and better layout options for HVAC and plumbing. Xeriscaping, or landscaping with native and drought-tolerant plants, is functional, beautiful, and reduces water consumption. Solar Panels mounted to a rooftop supplement a household’s energy needs as a clean, renewable power source. Recycled Plastic Lumber and Wood Composite Decking are durable alternatives to natural wood. Solar Accents, like these path lights, are available in a variety of options and affordably and easily enhance outdoor spaces. Preserving Mature Trees at the building site reduces waste and labor for removal, provides shade, wind-breaks, and landscaping, and filters pollutants from the air. 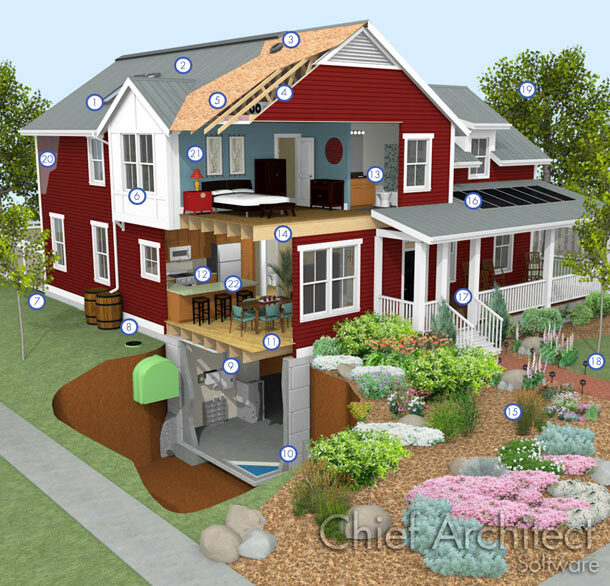 Advanced Framing, or Optimum Value Engineering, a construction technique designed to use less lumber, optimizes the spacing of framing members to reduce waste and increases framing cavity size to allow more space for insulation. When specifying insulation, look for types with a high R-Value. Low VOC and Zero VOC (volatile organic compounds) Paints and Stains produce little-to-no odor causing or toxic emissions when compared with traditional solvent-based paints, and are still available in the same durable and beautiful colors you love. Recycled Content Shingles look like Cedar, but are manufactured from reclaimed sawdust, metal, plastic, and tires, and weigh a fraction of its predecessor but lasts just as long. This roofing can be re-recycled at the end of its lifespan.